Approved last week by China's Telecommunication Equipment Certification Center, the unannounced Samsung Galaxy Mega On (model number SM-G600) is likely going to be officially unveiled in the near future. Until then, we can already take a good look at the device, thanks to the same Chinese certification body, which today posted photos of it. As previously reported, the Galaxy Mega On is not a high-end smartphone. It doesn't really look like one, either, though the bezels on the sides of its display seem to be pretty thin. Speaking of the display, this is a 5.5-inch one with 720 x 1280 pixels, making the Mega On a relatively large handset (151.8 x 77.5 x 8.2 mm). The new Galaxy runs Android 5.1 Lollipop, and is powered by a quad-core Qualcomm processor (possibly the new Snapdragon 412). Other features include LTE connectivity, a 5 MP front-facing camera, a 13 MP rear camera with LED flash, 8 GB of expandable storage space, and a 3000 mAh battery. The Mega On that's been approved by China's Telecommunication Equipment Certification Center (aka TENAA) seems to have only 1 GB of RAM, but we've heard that a version with 1.5 GB of RAM might also exist. 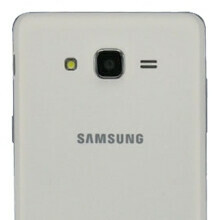 Alongside the Galaxy Mega On, Samsung is reportedly getting ready to launch a 5-inch Galaxy Grand On, too. Well, we'll let you know when these two new smartphones are announced - stay tuned! Samsung: a company that releases a new phone every 2 weeks.